A lovely warm start to any winter occasion. Method for Hot Punch Heat but do not boil the whisky (Dangerous!). Pour the hot tea over the sugar and lemon and stir with a silver spoon until all the sugar has dissolved. Add the warm (but not boiling) whisky. Flame and serve. » Approx 300g/101oz raspberries (strawberries can also be used). » 280ml/10 floz/one cup double (heavy) cream. » 2 tablespoons good quality honey. » 2 tablespoons single malt whisky. » 2-3 tablespoons of oatmeal. 1. Place the oatmeal in a cool, dry pan and turn on the heat to simmer. Stirring occasionally, toast the oatmeal until it is golden brown. This process could take between 10-20 minutes. 2. Once the oatmeal is brown, turn off the heat and let it cool in the pan. 3. Place the cream in a bowl and whisk up until soft and relatively thick. 4. Add the honey and single malt whisky and fold it in with a whisk, until it is soft and creamy. 5. Pick out some of the best raspberries for decoration and add three or four to the bottom of each serving glass, leaving a few for final decoration. 6. Add the rest of the raspberries to the cream mixture and fold in carefully, breaking up a few of the raspberries to obtain a slight colouring to the cream. 7. Spoon the mixture into the serving glasses, then add cream to the top to make an even base for the oatmeal. 8. By now the oatmeal will be cooler. Using a teaspoon, evenly sprinkle the oatmeal over the dessert. Add a raspberry for the finishing touch and chill for about three hours, or overnight. 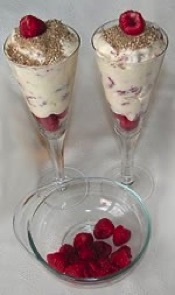 Cranachan can be served on its own, or with double cream and more raspberries. For an extra treat, make up the cream and add the raspberries as in 3, 4 and 6 above. Then freeze in a container for a yogurty fresh ice cream. Place the chicken, giblets and onion in a large saucepan. Add the water and bring to the boil. Cover and simmer for 1 & 1/2 hours until the chicken is tender. Return the meat to the stock, then add the leeks, rice and grated carrot. Bring back to the boil, cover and simmer for a further 30 minutes. Season with salt and pepper to taste. Add the parsley before serving. Beat/Mash the Potatoes and Turnip together while still hot and mix in the butter, chives, small onion and seasoning in order to make a light consistency. Season well with salt and pepper. 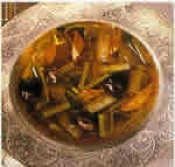 Can be served as a meal with haggis or as an accompaniment to many stews or fried meats.